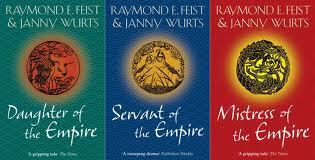 This collaboration trilogy between Raymond E. Feist and Janny Wurts is part of the larger RiftWar Cycle series of fantasy books by Feist. The trilogy begins with Daughter of the Empire, our main character being a young noblewoman called Mara, daughter of the Lord of House Acoma, poised to enter temple service but denied this wish at the threshold due to the murder of her Father by the nefarious (I never get to use that word enough) Lord of the Minwanabi, resulting in her immediate ascension to the title of Lady and forcing her into the backhanded power struggles of the Tsuranni Empire, in a world reminiscent of a medieval Asia due to the importance given to codes of honour and civility, with greed and brutality behind the scenes driving the political machine. Her world runs on a caste system, consisting of extremes in privilege and poverty, people bound to the Wheel of Life by their actions, therefore to die with honour is infinitely preferred to running away to live another day, due to both the ripples of shame upon your family as well as impacting your quality of life in the next plane of existence. The book lacks cheesy axe-wielding slabs of mindless beefcake briefly wrestling with the heaving bosoms of powerful female mages who seem unable to resist their manly charms, given more to following the intelligent and discreet Mara as she pursues her main goal of getting her revenge on the Lord of the Minwanabi, while at the same time improving the perilous financial situation of the Acoma Household and cautiously navigating the delicate power struggle of being Lady of a House with very few supporters, seemingly hovering on the brink of being wiped out by any of the rival Houses who would do so simply to raise their reputation among their peers within the Great Game. The story unfolds at a great pace, with no long boring narratives or periods of inactivity as Mara cannot afford to sit still, and Feist and Wurts manage to keep her likeable regardless of the inhumane, calculating decisions she has to make in order to survive, and although her manner can sometimes come across as cold or loveless, we appreciate that this is due to the society she has been raised on and groomed to take on. Her character is balanced out with occasional glimpses of her humanity and kind nature, and we see the difference in her leadership style compared to the more ruthless, bloodthirsty Lords around her. In the second book Servant of the Empire we again join Mara as Lady of House Acoma, having survived the initial baptism by fire of leadership in Book 1 and raising her House into a much stronger position, being able to take a less defensive approach to the Great Game and actually go on the attack in order to guarantee House Acoma’s survival. We get a much more detailed insight into how Tsuranni society is structured and are also introduced to Barbarian slaves brought in from off-world through a rift in space which the Tsuranni fully exploit, bringing back great wealth, slaves and also war. Due to Mara buying a consignment of Barbarian slaves, she is exposed to a new culture and approach to life, focused on self preservation rather than the die-with-dignity approach her own culture embraces, which causes a number of conflicts as she questions the principles her civilization adheres to. In Mistress of the Empire we again join Lady Mara, again remaining on her feet having cleverly plotted House Acoma into a position of strength and power, no longer having to worry about being picked off by smaller Houses. In the conclusion to the trilogy we follow Mara as she faces her biggest challenge, not from rival Houses in the Great Game, but from a secret brotherhood of assassins who have declared war on her, as well as The Black Robes, a group of power-wielding mages who work above Tsuranni law in pursuit of their own mysterious goals. Mara gathers allies from anywhere she can in order to take on this final threat, uniting alien species and Houses together for a final confrontation which challenges all her intelligence, power and connections.